Developer Speedbump has released RobotGladi8tor, an iPhone and iPad game that’s truly like no other. With promises of an intriguing story and gameplay that’s heavy on action, the title has a lot to live up to. Read the rest of the review to find out whether this app worth a purchase. RobotGladi8tor begins with a tutorial, letting your character wake up with no recollection of the events prior. Time is taken to teach you how to control your character, with instructions coming from a character who refers to himself as your handler. You find out during the early stages that you were a space marine who botched an operation, and were then sold to the highest bidder. Your handler, it turns out, bought you in order to have you fight robots for the amusement of viewers. The only way to free yourself from this fate is to win your battles. It’s a strong enough catalyst with enough mystery to make you want to keep playing. Even though it’s sparse on dialog, the presentation helps keep things moving along. Speaking of presentation, that’s one department where the title shines. From the start, RobotGladi8tor manages to wow with its graphics and overall presentation. It features 3D graphics that are beyond what you’d expect from an iPhone app and most mobile games. Textures are smooth and rich with detail, while the character models have more than enough detail. 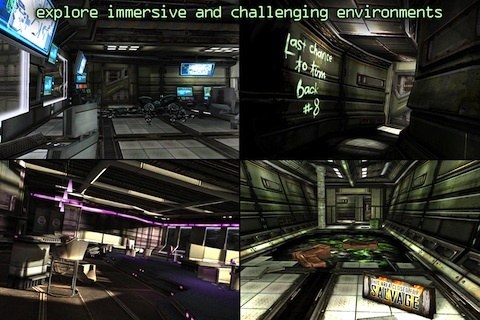 The dark environments had me concerned, as I’ve played other games on my iPod Touch and had a hard time seeing things clearly. Fortunately, this wasn’t an issue in RobotGladi8tor. I never once had issue with the dark environments on the relatively small screen. Graphics aside, the mechanics in RobotGladi8tor make it an enjoyable experience. They’re simple enough to work on a touchscreen, but have enough depth to keep RobotGladi8or from being simple. Moving around the environments is simple, you use an on-screen joystick to move and swipe the screen to look. Once you’re in battle with a robot, you have a number of controls. Attacks are based on swiping in certain directions, with the ability to dodge attacks using one of two on-screen buttons. Once you progress through the title and find weapons, you can use those in battle as well. Simple enough, RobotGladi8tor is an application worth buying, as long as sci-fi fighting titles are something that interest you. It starts out a little easy, with tutorials built into the battles. I was progressing easily enough, and then was given the option to turn the guide off. I did so, and in my next battle I lasted less than a minute. Between this and the difficulty options, the title has enough variation to be challenging for players of any skill level. It’s available on all iOS devices, including the iPhone. Again, if this sort of game interests you, it’s well worth the cost of the app. 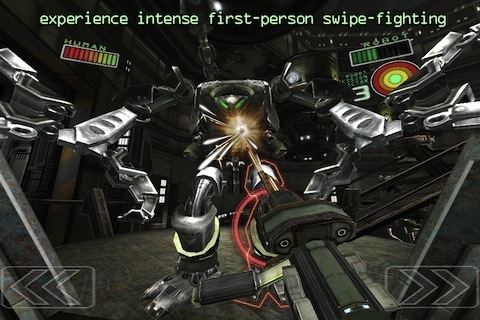 AppSafari review of RobotGladi8tor was written by Darius Reimm on February 20th, 2012 and categorized under Action, Adventure, App Store, Fighter, Games, iPad apps, Universal. Page viewed 3951 times, 1 so far today. Need help on using these apps? Please read the Help Page.